And these are our works. FLUOR is the largest agency in the world because we have a first rate professional talent network offering creative and efficient solutions in real innovation that enables us to respond to any brand’s new challenges. 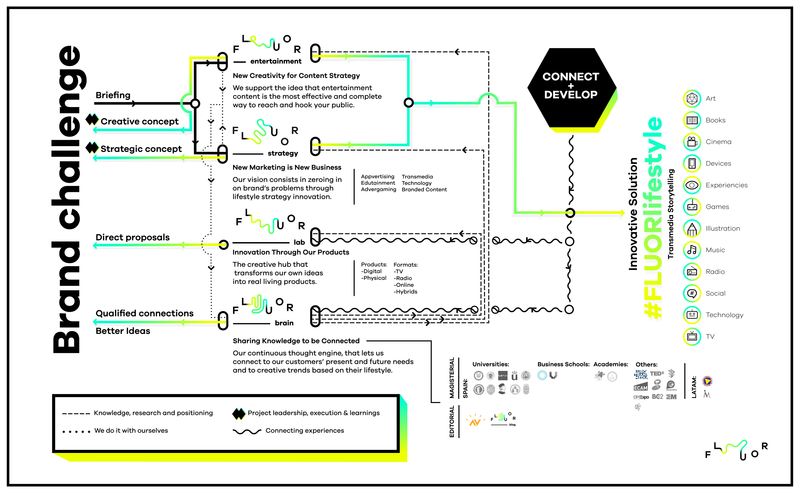 FLUOR is a unique model of collaboration, creative management and development of innovation following the Connect + Develop methodology. This allows the agency to face any concept, idea or communication campaign with the ability to always provide solutions, accomplished with thanks to the help of the best professionals and creative agencies in the whole world. FLUOR is a cutting edge work philosophy. FLUOR is a lifestyle. FLUOR is the future of contemporary communication. Do you want to become part of our collaborators network?